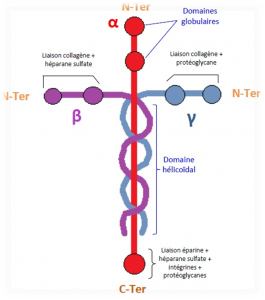 COLOSSIANS 1 – What’s Laminin?! 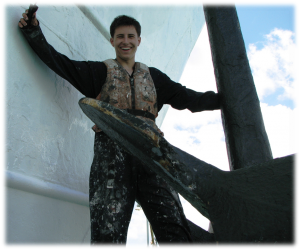 In the year before he died, our son spent six months in the Caribbean working as a deckhand on board the ship, Logos II. While away, he heard about Laminin – a cell adhesion molecule. It’s one of the layers in the basement membrane – a network foundation for most cells and organs. Because it helps cells stick to each other and to their surroundings, it’s the “scaffolding” in almost every tissue of an organism. It’s the glue that holds us together and it’s vital for the maintenance and survival of living tissue. Mikey got excited about Laminin after hearing Louie Giglio’s Passion Series messages. We found the DVDs in his sock drawer after he passed away. It’s amazing, in the first place, that humans have identified the mysteries of things that are invisible to the human eye. But it’s quite another thing to know that the fabric of LIFE is made up of microscopic molecules that are in this unmistakable shape. The shape that, at first sight, most people of earth will recognise – the shape of the cross. But what Paul writes in today’s chapter will almost certainly seem hard to believe. You may already believe that there’s a Creator God. But you’re not sure how Paul can so blatantly say such incredible things about Jesus! “Is He or isn’t He?” has been the question that’s perplexed the minds of clever people for 2,000 years, and none more so than today. Is it absolutely true that He is the image of the invisible God, the firstborn over all creation? [v15] Well… we are all (both male and female) created images of the invisible God. [a] But Jesus was different in that God put His Name in Him (not on Him but “in” Him) and, with that, He automatically got Father God’s authority – most especially on the topic of forgiving our rebellion, the central issue for the future of humankind. [b] If His word was the final word, than His word was God’s word. If the above is true – Jesus was indeed the Word of God become flesh, as John put it in his own book[c] – than what Paul writes in v16-18 is not just true, but it’s vital for understanding the scaffolding in the Creator God’s epic storyline. This is the laminin – that cell adhesion molecule that keeps popping up in the storyline throughout history, the one thing that glues together every story and every prophecy from Genesis to the 1st Century AD. It was the Father’s good pleasure (His own choice and for His own reasons) that He allowed the fullness of God to dwell in Him, and through Him to reconcile all things to Himself, having made peace through the blood of His cross… Although we were formerly alienated and hostile in mind, engaged in evil deeds, YET He has now reconciled us by His death, in order to present us before Himself holy and blameless and beyond reproach…” [v20-22] Amen to the God who not only knows exactly what’s gone wrong, but He, Himself, became the solution!